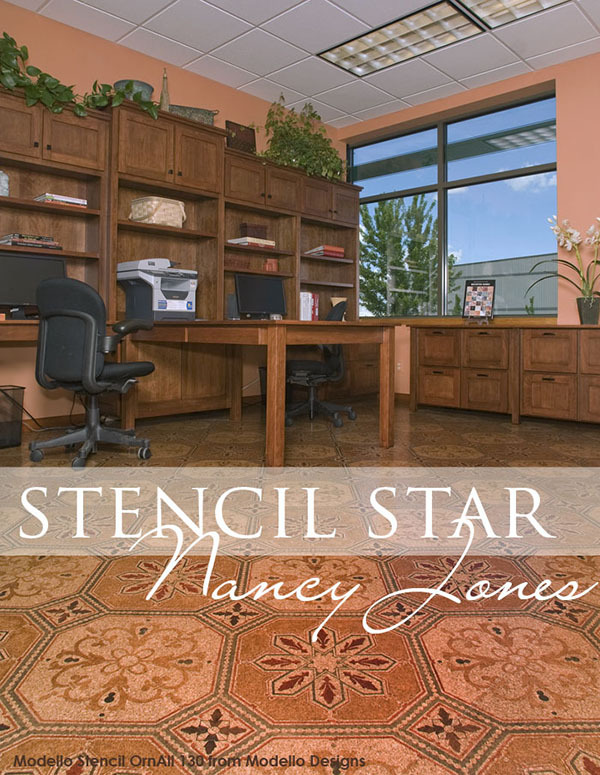 In this installment of our ongoing Stencil Star™ series, we feature the über-creative Nancy Jones, Founder and Creative Director of Washington’s Artworks Spokane. 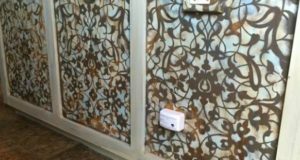 Besides creating amazing stenciled floors, her specialty is custom surface finishes for walls, ceilings, cabinets, furniture and more and she frequently uses Royal Design Studio Stencils in creative ways for her decorative painting projects. She’s traveled with us on many of our overseas painting adventures (Morocco, Italy, Spain!) and we’re happy to feature her sophisticated artistry and designs for you! 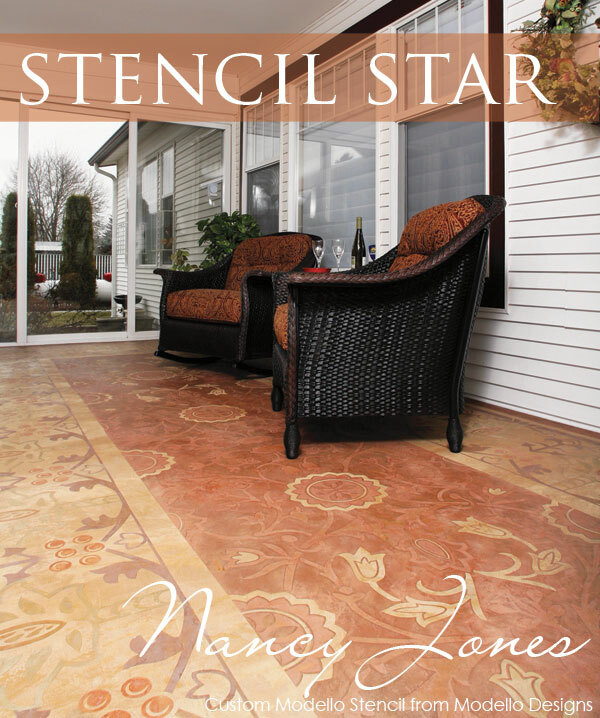 One of Artworks Spokane’s many specialties is stenciling decorative concrete. Above, a concrete porch floor has been beautifully warmed up by the addition of a custom William Morris-inspired stencil pattern from Modello® Designs and SkimStone. With such a warm array of colors and designs, it would be a pleasure to enjoy time relaxing in this space – what a great way to enhance your home! Modello® Designs vinyl stencils make it easy to add decorative patterns to concrete surfaces, and also and allow you to customize any pattern and have it sized and cut to fit your space precisely. I absolutely love pattern. I am also a fine artist, but find my students are not patient enough to learn the intricacies of hand painting. Stenciling allows them to be successful straight away as they learn only a few fine art techniques relative to shadow and light. 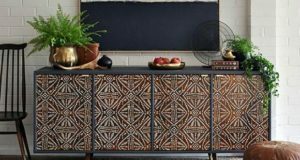 Incorporating faux finishes and textures with pattern is endless in regards to creativity and can be relatively simple to learn, step-by-step, without regard for shadow and light. Training then becomes more about product education and application techniques while expressing individual style with pattern. Stencils are so versatile: you can switch up the colors of the pattern at will and and also use them to decorate almost any surface! 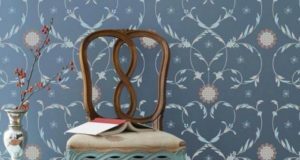 Above, stenciled walls and stenciled floors showcase the same pattern but in two different and complimentary color schemes. 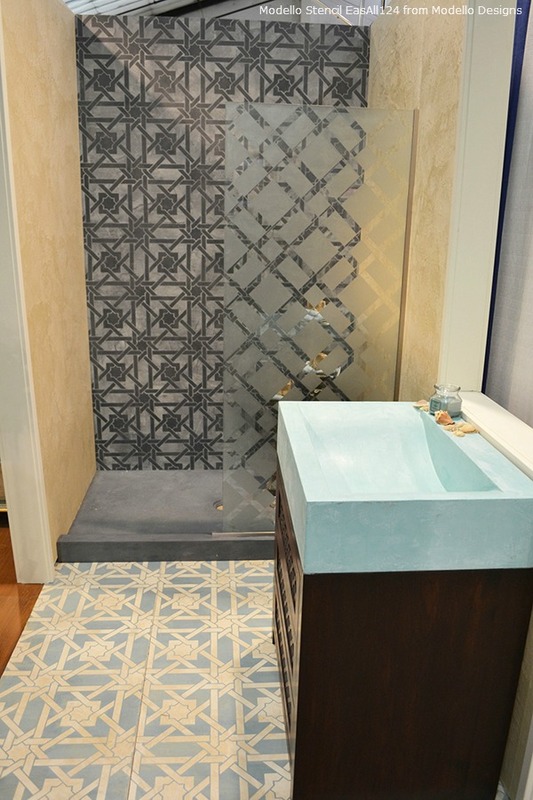 The Modello® Designs pattern used is from the Exotic East Allover Stencil Collection (EasAll124). For the same pattern in a reusable mylar stencil from Royal Design Studio, try the Camel Bone Weave Moroccan Stencil. How do you determine which pattern will work for your project? It’s all about the design scheme in which the pattern will “live”. A wall, floor or furniture piece does not live in isolation, but rather must fit into overall design scheme of the space. Ask, first, whether the patterned surface will stand out in its surroundings or become the background to enhance other dominant features in the room. Determine the scale…bold and grand, small and demure, or relative to the piece in which it will fit. Finally, understanding color relationships, determine how much color will be introduced in the pattern. And, of course, LOVE the design. A formerly plain wood floor now has a stylish painted and stenciled faux rug with the help of an Ornamental Medallion Stencil (OrnCen128) from Modello® Designs. This beautiful design greets the many students at Artworks Spokane, so not only is the stenciled floor visually appealing, but it is also quite durable! We love the stenciled accents on the walls and dresser, too. When incorporating fine art principles into shading a pattern, always begin off-loading your brush in a triangle area of the motif you are painting. The triangle usually indicates that that area of the pattern is behind something else which would create a shadow. The brush is fully loaded at this point and will leave more paint in that area. Lift the pressure on your brush and move around the perimeter of the motif, leaving the darkest color in the triangle. Cork flooring is perfect for an office space as it’s easy on the joints, quiet and durable. When you buy unfinished cork, it also makes a wonderful surface to stencil on! 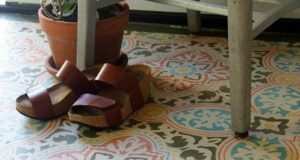 Using the Modello Marquetry Method, this cork stenciled floor was stained with an Allover Marquetry Stencil (MarqAll107) from Modello® Designs. “Transforming ordinary surfaces into works of art” is ArtWorks Spokane’s tag line. Stencils help us to use ordinary paint, plaster and decorative concrete far more creatively than our competition. We listen for the “wow” when prospective clients walk into our showroom because they see pattern everywhere. It’s stenciling that sets us apart! Stenciling on cork floors adds beautiful pattern and color to the beautiful, neutral surface. 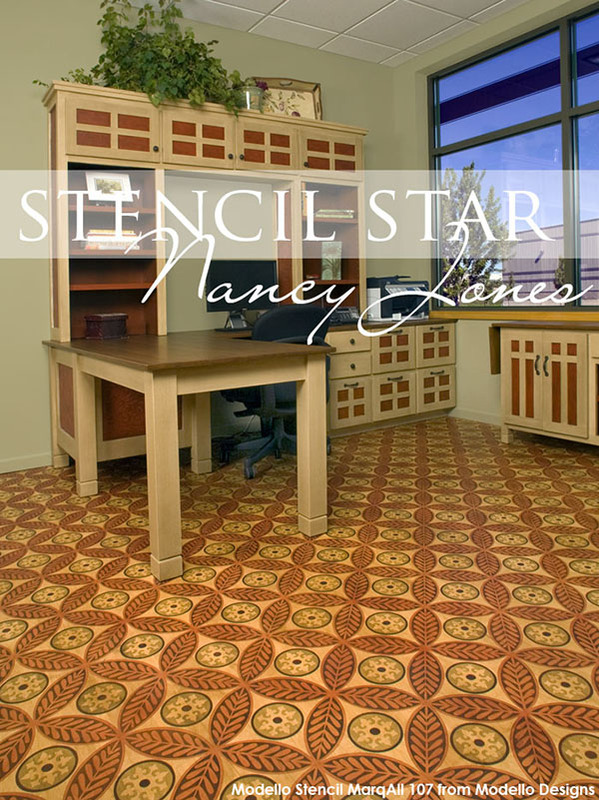 Nancy Jones used an Ornamental Allover Stencil (OrnAll130) from Modello® Designs to add panache to this studio office. Isn’t the floor stencil pattern gorgeous? 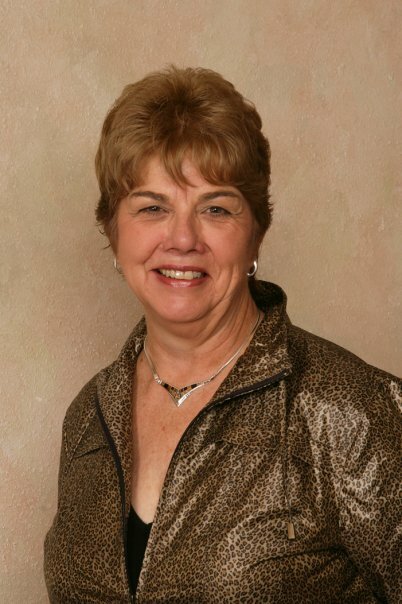 Nancy has been a decorative artist since 1974 and a decorative painting instructor since 1985. She has experience in all aspects of the decorative painting business and in addition to her workshops, she and her team of trained decorative artists for Artworks Spokane do custom faux finishes, designer plaster applications and decorative concrete finishes in client’s homes. I have had the pleasure of teaching workshops at Artworks Spokane and seeing all of these stunning stenciling projects. Nancy has been an inspiration to me for years and a traveling roommate. She does everything one way – classy and her staff follows her lead. Kudos to all, and for the new location! Debbie, I agree – her elegant touch shows through each and every project. 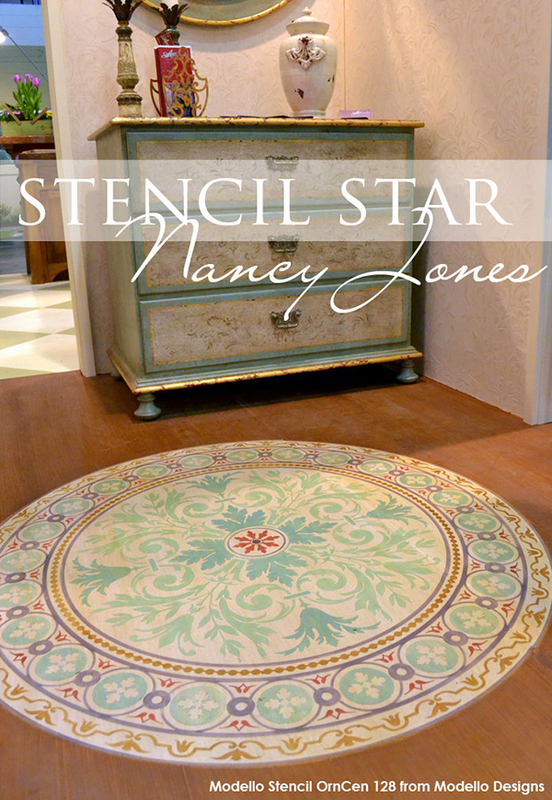 Her stenciling and finishes are impeccable! Look forward to seeing what else she cooks up. I am an amateur who would like to do something similar to the porch design in my basement and ensure the finish is indestructible. Where do I find product? Can stencils be ordered? I am in Regina, SK Canada. Is there someone here?? Yes, yes, yes Nancy’s studio and staff are mind blowing. I have had the pleasure to visit her studio last year and again this year after she opened her second location. My husband and I were awestruck with the first location, but the second one is just beautiful. Every corner you turn is another “Gasp, this is amazing!” Her staff of talented beautiful people are such a treat to be with. You can tell they truly love where they work and what they do. Way to go Nancy.